Home / IT Service Management / IT Service Automation: How Does it Fit into ITIL Service Management? 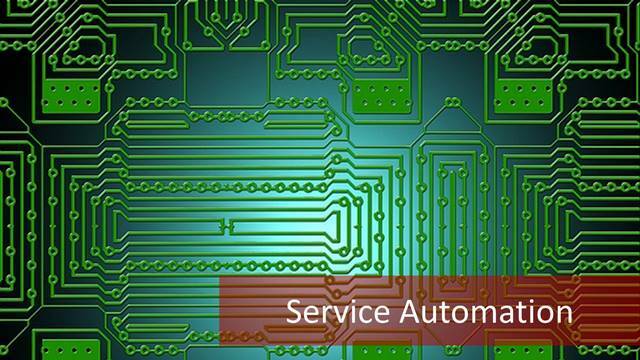 Service automation is generally considered to improve both utility and warranty of services. As online ITIL training specifies, utility and warranty of services are crucial components of a service when creating value to a customer. One of the most beneficial properties of service automation comes from the fact that a process will be executed in the same way every single time. Such precision in repetitive execution is virtually impossible when human labor is involved. Therefore, if there are processes or services that follow the same set of steps or activities, IT service owners who have completed an ITIL course will know that it is service automation is the best route to improve efficiency in the service provider organization. Let’s consider that you are running a call center unit of an airbus company. 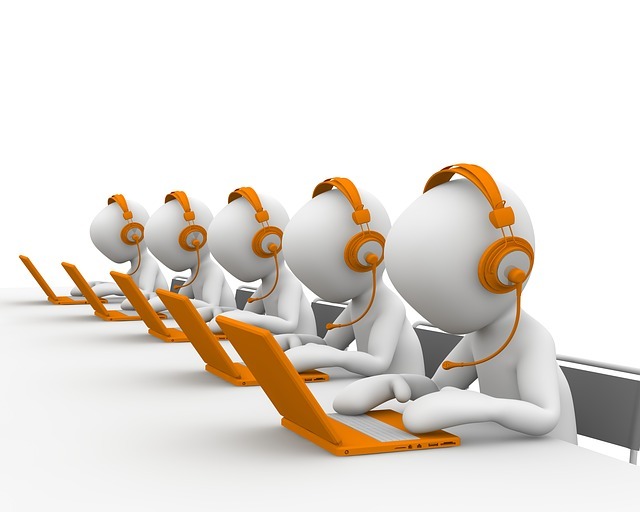 The call center is highly supported with an automated IVR system. Based on the questions or keywords of the customers, most of the customer requests are handled without connecting the customer to a call center representative. In the case of peak periods, let’s say Christmas period or during summer, if the call counts to the call center increases, you can increase the capacity of the IVR system to handle more calls coming from the customers. But if this automated service was not in place, you would have had to hire more call center representatives to answer higher demand coming from the customers. Changing the capacity of an automated IVR system is much easier compared to hiring new call center representatives or firing representatives when there are not that many calls in regular seasons. In this way, service automation saves resources. This means that the service can serve the demand across time zones. If you consider the automated IVR call center system, since it is a machine, it can serve customers for 24 hours per day. But if you do not have such a system, you need to plan shifts and call center representatives must serve in these shifts to customer calls. This is an important aspect that companies with a global footprint need to take into account when planning a new service or when optimizing an existing service. Service automation generates data that can be used to measure the performance of the service. Unlike processes that are operated by humans, this data will be very precise and accurate. The IT service owner can use this data in the Continual Service Improvement stage of the ITIL lifecycle to identify aspects of the service that is not functioning properly and that can be improved. Service automation makes it easier to detect problems in service performance, not only because the accurate data is received, but also because service inefficiency due to human error is not part of the equation. For instance, when employees move within the organization or leave it permanently, you will not suffer such a great loss of knowledge if you had applied service automation. If you consider the call center example, when a call center representative moves to another department in the company or resigns from the company, you need to hire a new call representative and teach him or her to answer calls of the customers from scratch. But if you have the automated IVR system, you will not have such a problem. If your service processes are simple and contain routine steps, then these services can be automated easily. The main objective of simplification of service processes is reducing the performance variations by reducing process steps. IT services with low-performance variation will deliver a consistent service to the customer which will create more value to the customer and subsequently to the business. With an automated service, human interaction with the customers, with a higher degree of variance, are reserved for very specific cases. This way, the service can run effectively and with optimal efficiency. If you can draw a reasonable relationship between activities or interactions, and if these are routine or followable steps in each time, then service automation can be implemented to improve performance, efficiency, and quality. Performance, efficiency, and quality can be measured and improved upon through Continual Service Improvement processes. By continually improving IT services, customers receive the best service that the company can deliver and the service will be of optimal value to the company. 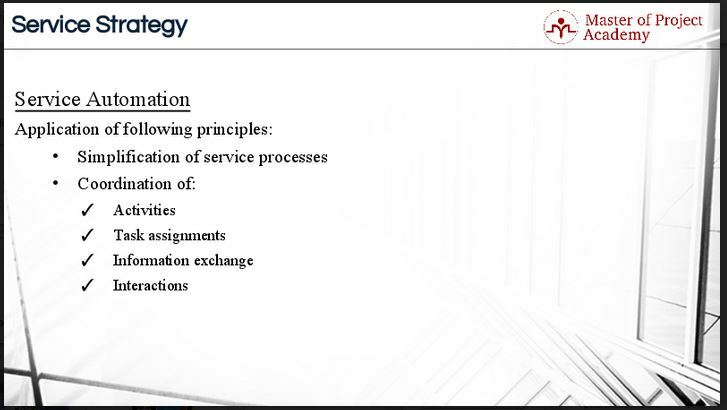 Continual Service Improvement is an important part of the ITIL lifecycle: it envelopes all the other ITIL processes and stages of the lifecycle. It also ensures that services are effective and efficient. IT service automation not only saves expenditures on resources but also allows effective management of services available to customers. Depending on the type of service that is being designed during the Service Strategy stage of the ITIL service lifecycle, service automation should be considered during the planning stage. Service automation will have a financial impact on the service strategic parameters as fewer resources will be used. The estimated demand for the service may well be a driver for deciding whether to automate the service or not. Similarly, the need of the customer to interact with a real person will affect whether service automation will be needed or not. Service automation is a critical part of developing a successful strategy for a new or optimized service. ITIL Financial Management for IT services: Is Finance Part of Your Service Strategy? Enroll in our Free Courses and access to valuable materials for FREE! - No Credit Card Required. Ultimate PMP certification guide that will clear out all of your questions about PMP certification exam. Read & learn everything about PMP certification. We've gathered the 18 Project Manager Interview Questions that you will be asked most probably in your project manager interview session. Get ready for your job interview session. Quiz: What is your ideal salary if you would be working in US? Answer the following 7 questions and we will determine your average salary if you would be working in US! PMP Salary All Aspects: How much will you earn if you get PMP? You know PMP- Project Management Professional certification is very important to project managers. As a cost savvy project manager, equally important is the PMP Salary hike expected or what is my ROI- Return on Investment. You can understand the PMP salary increase, the cost involved, benefits both tangible and intangible from PMP Certification. We have created a quiz that will evaluate your project management experience, education level and contact hours eligibility to determine whether you are eligible to sit for PMP certification exam. Check whether you are eligible to sit for PMP Exam.